The access gap is very real. According to an analysis of the U.S. Census Survey of Income and Program Participation, The Pew Charitable Trusts estimates that 36.2% of American workers do not have access to either a defined benefit or defined contribution plan sponsored by their employers. One proposal relies upon legislative action to eliminate barriers to open multiple-employer plans (MEPs) and requires private employers to auto-enroll their employees in a defined contribution (DC) plan. Thus, universal access to DC plans could become a reality, and the access gap would be quickly bridged. A surge in new participants contributing to employer-sponsored defined contribution accounts has substantial benefits. The Employee Benefits Research Institute (EBRI) has estimated that universal DC access could contribute $740 billion towards reducing our nation’s $4.1 trillion retirement savings shortfall. There’s just one catch. The introduction of universal DC access could generate a veritable tidal wave of retirement savings cashout leakage and small retirement savings accounts. Today, there are approximately 66 million active, contributing defined contribution plan participants. Of these active DC participants, about 14.8 million, or 22%, will change jobs each year. Of the 14.8 million annual job-changers, 4.7 million, or 31% million will cash out at separation, paying taxes and penalties. In the years following separation, another 1.3 million will cash out, for a total of 6 million cashouts. Over a generation, that’s 261 million participants who’ll cash out. 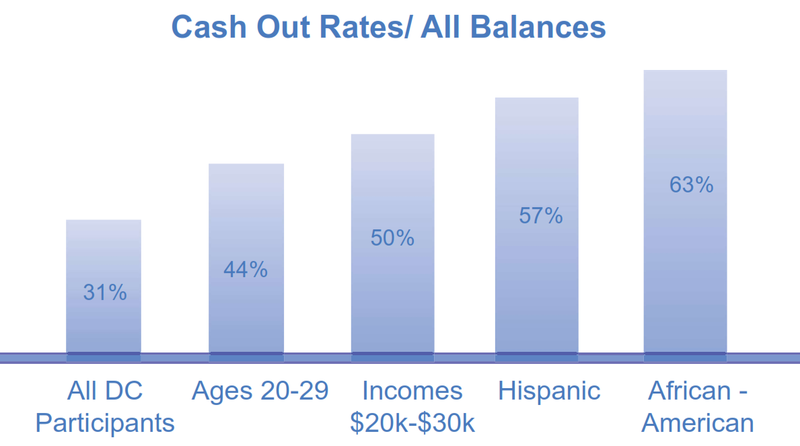 Those disproportionately affected by the cashout leakage epidemic include Millennials, lower income segments and minorities, all of whom cash out in greater numbers than the general population of DC participants (see chart). Since these happen to be the very same segments of our population that the Pew research indicates will benefit the most from expanded access, it stands to reason that a surge of participants with these characteristics could exacerbate the problem of cashout leakage, all other things remaining equal. Using the Retirement Clearinghouse Auto Portability Simulation model, increasing active DC participants by 36.2% boosts annual participant cashouts to 8.2 million, a run rate that could drive 357 million cashouts over a generation -- an increase of 96 million vs. current levels. For plan sponsors, expanding access (particularly in those industries with high employee turnover) could also create a proliferation of small balance accounts left behind by those job-changing participants who don’t cash out. These additional small-balance accounts would create an administrative burden for plan sponsors, resulting in increased plan costs, missing participants and uncashed distribution checks. The dual problems of cashout leakage and small accounts, if not addressed, could mean that a program of expanded access could eventually become a Pyrrhic victory for the defined contribution system. Fortunately, there’s a perfect complement to expanded access: moving retirement savings forward when employees change jobs. A study by Boston Research Technologies indicates that most cashouts occur simply because it’s the easiest action for participants to take. In fact, only 37% of participants who cash out indicate that the reason is a financial emergency. Providing participants with easy portability of their retirement savings has been proven to reduce cashout leakage by 50%. EBRI recently conducted an analysis of the value of auto portability, and found that it reduced the retirement savings shortfall by $2 trillion, when applied to all balances. When applied to balances less than $5,000, auto portability contributed $1.5 trillion. 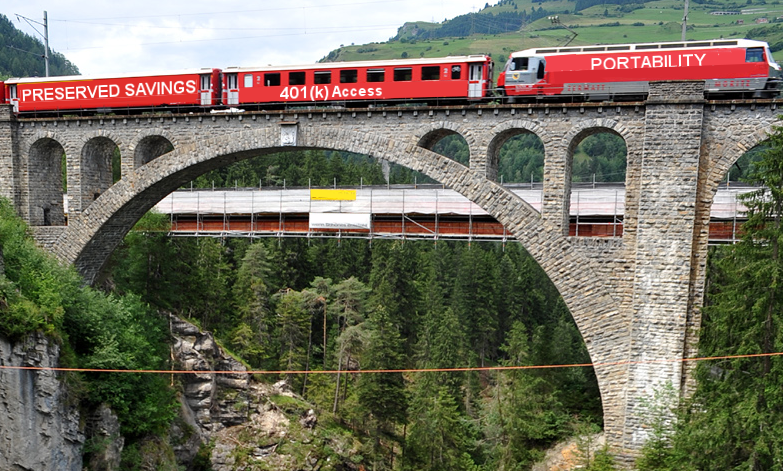 For plan sponsors, a program of auto portability would mitigate the problem of small accounts, serving to raise average balances while promoting plan efficiencies. The value of preserving $5,000 at age 25 is worth $70,000 at retirement. Preserving another $5,000 at age 35 increases the total value to $105,500. Preserving yet another $5,000 at age 45 yields $123,600 at retirement. While it’s clear that whatever can be done to expand access to workplace retirement savings accounts will be beneficial to Americans’ retirement security, it’s also equally clear that we should take steps now to preserve our savings through a program of retirement savings portability, thus putting an end to the scourge of unnecessary cashout leakage.